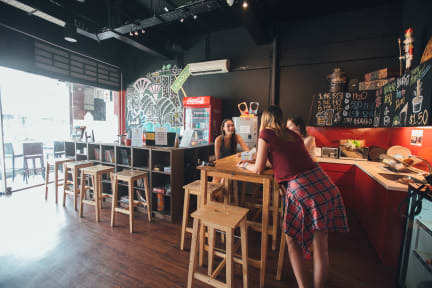 Green Kiwi Backpacker Hostel is a laid-back place featuring a large rooftop garden terrace, perfect for finding a quiet moment in the busy city. 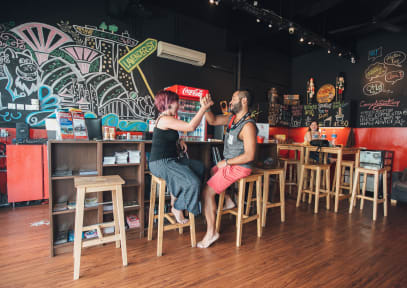 Many Hostelworld guests have said they'd stay here again, saying it's 'a real home away from home' and that the friendly New Zealander staff have 'a broad knowledge of the city and what to do and see'. They have a popular free breakfast and are located just 10 minutes' walk from two metro lines. Managed by Rucksack Inn @ Lavender, Green Kiwi was voted Best Hostel Singapore 2014 by Hostelworld! Located along Lavender Street, Rucksack Inn is within a 10-minute walk to the heritage neighbourhood of Little India. This hostel is fully air-conditioned and guests can relax on our Alfresco Rooftop. Free WiFi is available throughout the property. Dormitory rooms come with reading lights and USB universal power sockets. Breakfast is served every morning with toasts, different type of spreads and fruits. You can enjoy all day coffee and tea too! Rucksack Inn is 500m from Bendemeer MRT Station and 850m from Boon Keng MRT Station. The local bus station is 2 minutes away with direct buses that lead you to major local like Bugis, Arab Street, Chinatown, Gardens by the Bay, Marina Bay Sands Hotel, Orchard Road and more. Visitors going to and coming from Malaysia will also find us conveniently located as pick-up and drop-off points for buses plying the Singapore-Malaysia route are located a mere 20 minutes away. I\'d say the most unique feature of our hostel is the rooftop garden. It\'s big, it\'s lush, and it\'s a great place to hang out, especially in the evenings when it\'s cooler. We can\'t help that it\'s hot in Singapore during the day, but you can sunbathe if you like. Also, our breakfast puts us ahead of the rest. We provide a variety of spreads and breakfast lasts till 12.. or later! So you can sleep in! We also provide complimentary all day coffee and tea.